Social media is here to stay. As much as you’d like to, you can’t just ignore it and hope it will go away if you want to be successful both now and in the future. 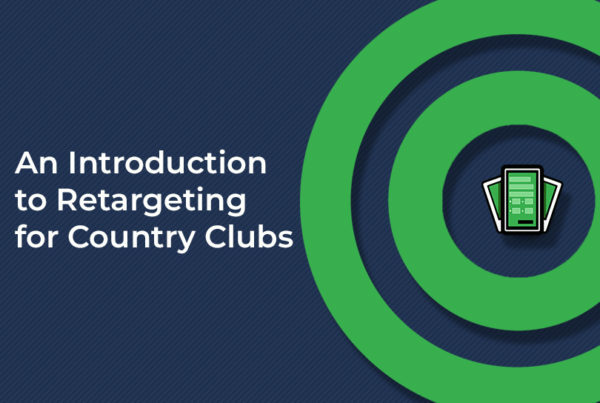 It can be challenging for country clubs and golf courses to figure out exactly how to effectively use social media marketing to reach their audience, so this blog is meant to break down exactly how to use social media for golf courses! 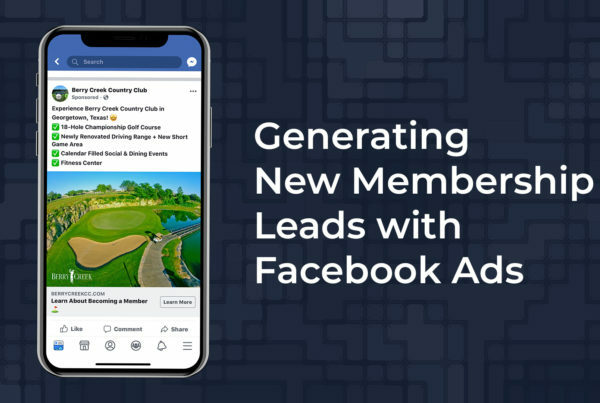 With more than 1.1 billion users, it’s now possible to reach and connect with people from all walks of life, especially golfers. 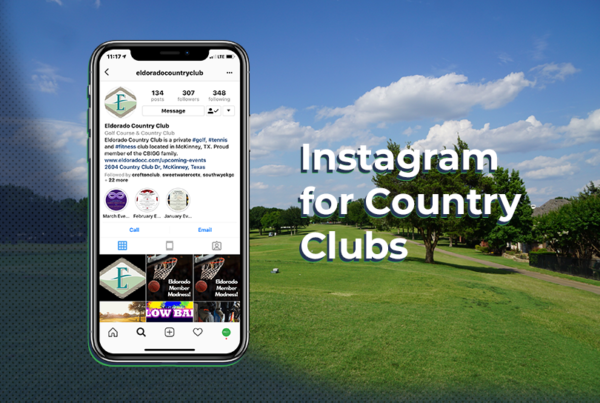 Local community groups, local golf-related groups, and local business pages are a great way to reach out and connect with your community and get more people following you on social media. Regardless of where you live, there are social media accounts set up to engage your local community. In my town, “Chino Hills Connections” is a go-to resource for members of our community. Be sure to engage in local discussions to raise the profile of your social media pages. You can also share events and updates from your business page into the groups. Just be sure to check with each groups’ rules before posting any sales and ads. You may have seen golf trick shot videos, golf equipment review sites and golf course aficionado social media posts all over the internet. Many of these are shared in Facebook groups that revolve around golf topics. Do a quick search on Facebook to find some that are relevant to your consumer base and start joining them. Just like with the community groups, be sure to read the rules before posting and sharing content from your business page. Quick Takeaway: This is a great way to find the latest content related to the industry and you can share their content within your own community! Local businesses are a great resource for golf courses to reach out to. Not only are they great prospects for events and tournaments at your golf course, but the people that visit those pages are likely people in your community. Quick Takeaway: Set up 10 to 30 minutes towards the end of each day to get on Facebook, Instagram, Twitter and any other social platforms you’re using and respond (thoughtfully) to people who have engaged with your content and in other local groups. Sweepstakes, contests, and giveaways have proven time and time again to be very effective social media marketing tactics for engaging an audience. Many would consider a social media contest to be one of the best golf course marketing ideas out there as it will create awareness, provide you with an opportunity to collect lead information, generate customer referrals, foster brand loyalty and much more. As a best practice, select a prize for your contest that is relevant to your brand and enticing enough to encourage participation. Quick Takeaway: Try running a contest offering a free round of golf or a discount at the golf shop to get people excited and engaged. People love checking-in on social media at various destinations and offering their opinions on the venue. By encouraging your customers to discuss your golf course on social media, you’re opening up the door for them to talk about how wonderful your golf course is. Sometimes there is no greater way to sell your products and services than your customers! Use your brand advocates to your advantage! Quick Takeaway: Start, use and promote a club-specific hashtag. Make sure it’s specific to your club and isn’t already used. Use the hashtag on all your content and post around the club to encourage everyone to use it. Give your audience a view of your golf course from behind-the-scenes that they can’t get anywhere else. A lot goes into making sure your customers have an amazing experience when visiting your golf course and showing them some of your hard work can help them appreciate their experience more. Social media is a great way to share images that give your fans a behind-the-scenes look at your business and help them feel more connected. Instagram is the perfect social media platform for sharing these sneak peeks as the site provides you with a number of filters and editing tools to optimize the quality of your photos. If you need help taking quality photos of your course, check out the 7 tips for better golf course photography using your iPhone blog by Blake Davis! Quick Takeaway: The second you get to the club tomorrow, go on the course, snap a pic and post it up to Instagram, Facebook and any other social channels you’re using. The key is to just get started! Include signs on your course, in the clubhouse and in the golf shop that tell your golfers where to find you on social media. Identify a popular picture taking spot on your golf course and include signage letting your golfers know this is a great spot to take a photo to share on social media. They will likely follow and share their experience at your course with their friends too. Train your staff to let your golfers know to follow you on your social media channels for special offers, updates and course conditions. Use a scrolling feed to show your golfers what you’re posting and what your golfers are posting on social media in your shop or clubhouse. Quick Takeaway: Start brainstorming and creating different signs/promo material to use. Sometimes you may have to try a few variations to see which works best for your club. #6 And Lastly, GET VISUAL! Text alone is dead. Facebooks algorithms killed it a long time ago. Visual content draws the viewers into the post and, as a result, gets higher engagement. Golfers are twice as likely to comment on a post that has a picture or video than a post with just text. Visual content can be in the form of photos or videos. ▪ A picture of a ball mark on one of our greens before we ask the question. ▪ A picture of one of our golf carts next to the clubhouse. ▪ An aerial video of the 167-yard 12th hole at your golf course. Quick Takeaway: Don’t waste time with text only posts on Facebook and get in the habit of posting photos with anything and everything! Apps like Canva help you create custom graphics that even a beginner can master and can help tremendously with this problem.